These zesty treats originated in Spain, but are popular street fare today. A tender crust bakes to perfection around a mixture of sweet shrimp and a classic pico de gallo, featuring ripe tomatoes, jalapeños, and fresh cilantro. Each bite is full of flavor. Our new favorite, we just can’t stop singing their praises! Choose from six or twelve 4 oz. empanadas. From thawed: Preheat oven to 350°F. Spray a pan with cooking spray. Place empanada in sprayed pan and place in preheated oven; on the middle shelf. Allow to cook for 14 minutes and until internal temperature reaches 165°F. Remove from oven and allow to rest for 1 minute. Empanada Wrapper (Wheat Flour, Water, Margarine [Vegetable Oils and Fats, Water, Salt, Emulsifier: Mono and Diglycerides of fatty acids], Salt), Liquid Egg (Whole Eggs, Citric Acid, 0.15% Water added as a carrier for Citric Acid. Citric Acid added to preserve color). 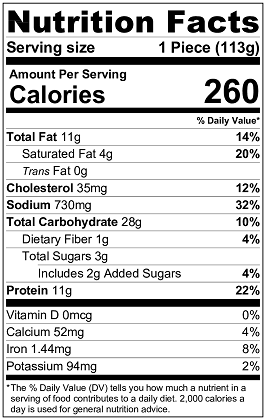 Contains: Crustacean Shellfish (Shrimp), Milk, Wheat, and Egg. Check items & click Add to Cart above to add to your cart with Shrimp Empanadas, or click here to select all. Items without a checkbox need further option configuration.